Jeff Gomez, founder of Starlight Runner, chats about the ingredients that make ‘transmedia’ unlike the standard cross-platform content, and explains how the discipline applies to brands, Hollywood movies, and even population activation projects for governments. Don’t let the title ‘guru of transmedia storytelling’ put you off. Brands such as Mattel and Coca-Cola have employed Jeff Gomez, he’s worked on the highly popular Avatar and Pirates of the Caribbean, and he’s currently engaged in a population activation project for the Colombian government to inspire young citizens to become entrepreneurs and global leaders. Visiting Australia this month for a series of masterclasses via X Media Labs, Gomez talks with Marketing about how comic books lead to video games to movies to brands to governments. 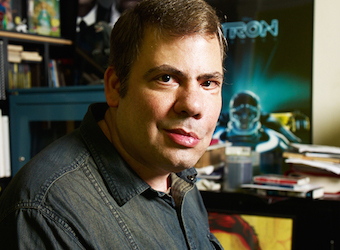 In the 1990s, he went to work for comic book and video game companies, and would “almost surreptitiously” create content that linked the story world together through different media. “When the fans recognised that I was giving the backstory to the video game on a website in 1994, they got very very excited by that and the content became extremely popular,” he explains. Marketing: Can you give an example of that? Jeff Gomez: I worked on a video game called Turok: Dinosaur Hunter for Nintendo 64. I was responsible for selecting the character from a catalogue of superhero characters from Valiant Comics and I chose that character because there was this rich world, so it readily adapted to video gaming. I found writing the concept for the game that I really couldn’t put as much back story into the game itself as I would have liked. The technology had limitations. So I offered to have that back story written and put up on an accompanying website and they said, ‘As long as it doesn’t cost us much money,’ and I said, ‘No, it won’t’. The server crashed when the fans found out. We were then able to create comic book tie-ins that gave other kinds of back story. I also built a way for the game fans to send feedback directly to me – their thoughts, responses – that was very unusual at the time. Game developers didn’t much interact with their fans. This created a very powerful bond – it is the beginning of what I call ‘the architecture for dialogue’ that must exist in any good transmedia implementation. M: So that’s the key thing that makes something ‘transmedia’? JG: The two things that really distinguish transmedia practice from standard cross-platform content is that bits of story are unique unto the platform you’re creating for, even though it takes place in the same story world, the same fictional universe. And, there has to be a way for the audience to respond to it, whether directly through interactive play, or by being able to submit their thoughts and creative content and so forth to some forum that allows for a dialogue. M: I see, and those defining aspects go some way to suggesting how the application of your work applies to government and universities and brands – but how did that jump occur? JG: It actually moved into somewhat of a more brand-based venue when I formed Starlight Runner in 2000 with a more formal approach to transmedia storytelling. In the nineties we were just kind of making it up as we went along. I had created a sort of system for brand analysis so that the messages of the brand could be extrapolated into the narrative content. The hybrid of the two was when Starlight Runner worked with Mattel, a large toy company, on Hot Wheels. There had been very little narrative built around those toy cars and there was concern that the company had for doing so, because if we got it wrong it could damage the relationship the consumer had with the toy. In order to get it right we had to discern the essence of the brand – the core fundamental messaging – that made Hot Wheels cars unique, even though there were many other types of toy cars. What made this particular toy special, what was the underlying ethos of the brand, in addition to the visual iconography and so forth? In order to do that we had to absorb enormous amounts of information from the client. We looked at their marketing plans dating back many, many years and we studied the fan base for toys, the collectors market, everything about it. We were able to come up with an ethos we could modify to make it slightly more sophisticated and that ethos becomes the chassis for the vehicle that would be the entertainment which turned out to be this elaborate animate universe. That demonstrated to me that this approach was not just applicable to comic books and sci-fi concepts but to things like Hot Wheels cars and Coca-Cola and other products. M: What are some examples of that dialogue aspect that separates transmedia from cross-channel communications coming into play? JG: Well, if we look at Coca-Cola and the case of ‘Happiness Factory’ which has been a campaign that started the whole ‘Open Happiness’ phase of Coca-Cola’s global dominance, we learned early on that the original ‘Happiness Factory’ commercial was enormously popular. Fans were watching it over and over again on YouTube and on Coca-Cola’s website and we wanted to understand why so we could help Coca-Cola and its ad agency Wieden+Kennedy to bring people even more deeply into that story world. In doing so we learned that, whether by design or coincidence, ‘Happiness Factory’ reflected a set of values that resonated with people who were tired of the global conflict, who were growing frustrated with the darkness in the world, and who were coming to appreciate the values of innocence and a strong work ethic that the commercials were exuding. But also a little subversive fun. So by taking that essence, which was the essence of Coca-Cola, and infusing it into other media we were able to create experiences that gave people joy in a similar way to the TV commercial. You could become an employee of the Happiness Factory on the web. You could play with the characters in a mobile app. You can meet the characters in Japan, because we localised the campaign to the cultural preferences of the various populations and the Japanese love creatures and would encounter them in supermarkets and things like that, and so forth… comic strips, sequel commercials, and things like that were all spawned out of it, a lot of them very interactive. M: How does that translate into government? JG: Look, I was raised in a situation in New York where there wasn’t much money. I was exposed to crime, and, you know, saw how tough it was for my peers in that kind of environment, and I always wished I could do something. The one thing I was noticing in our transmedia implementations, these large-scale Hollywood and brand implementations, was the way that people can unify based on aspirational elements in the content. So you develop a core fan base. [For example] Avatar has the global fan base because it espouses positive aspirational values. What if we could enter into a region and ask the storytellers there to remember the aspirational values of their own culture? The underlying mythology and pride that they had as a people. If they could remember it and speak inspirationally and tell stories that are metaphors for the current crisis they were facing and how those values could help them surmount the crisis, maybe we could effect some change. I was certainly inspired by the fact that social media had allowed for these remarkable spontaneous mass expressions of dissatisfactions in various parts of the world so all we’re really doing is helping to accelerate that by discerning what this problem is, what its roots are in history and in terms of the geopolitical situation, and doing what we do with brands and Hollywood movies which is to find the story in there that’s hidden. Having come over and empowered the people themselves to tell these inspirational stories that could trigger these kinds of movements. M: Are those stories always hard to find? JG: Well, because we are working with governments or a community of interests such as institutions, non-government organisations and so forth, and these things are expensive, we have to furnish the appropriate data to back up what we already kind of know to be true, if you get my drift. We have a data gathering methodology that we think is highly effective. A lot of it is being able to rely on certain institutions within the country to give us some of the data we need, but we also go out and solicit that data ourselves or with some partners of ours. A lot of it is story-driven, it’s narrative based. We’re allowing these people to express themselves and talk about their lives in ways that are giving us the information we need. M: What measures or outcomes are there, for example, in your work in Colombia? JG: It is an ongoing project so in that case I can’t get too detailed, but it has been amazing and they’ve been wonderful with allowing us to talk a bit about it. The progress that’s being made in Colombia is focused on the development of leadership and entrepreneurial aspirations in Colombian youth. The country has had a significant amount of difficulty cultivating these values in youth, and they weren’t quite sure why. There had been a number of years of peace, the educational infrastructure in Colombia is strong. The young people are happy, they’re enjoying the peace, they’re enjoying their youth. The technological infrastructure is becoming better and better, all the time. Why aren’t young people getting rich? Why aren’t they becoming global leaders? We had to go in and discern what was going on, strip away negative stereotypes of Colombia’s youths, and examine what the problems were. We determined what those were, and at the beginning of the summer we gave a talk there about it. I met with the president of the country, and they were amazed at the results. In the process of the very discussion we were having there was a kind of brush fire of interest and discussion about the subject where there had been none before. That’s just an inkling of what we’re capable of. We’re going to go ahead and implement the transmedia component of the project, but in some ways we’ve already made remarkable advances simply for opening up the discussion. M: The breadth of the work you do is quite remarkable. You’re coming to Australia for these master classes – what are you expecting in the audience and what are you hoping to impart? JG: Well, actually, Australia has been, in some ways, an early adopter of these techniques. One of the most prominent transmedia practitioners in the world is Christy Dena, who is Australian. She’s based there, and I see her as a colleague who has accomplished a great deal. There are also a number of producers of television and film who have accomplished fantastic things in transmedia. Really, I simply see myself as someone who’s coming to Australia with the most contemporary techniques, with ideas like the advances we’re making in brand-oriented transmedia and population activation transmedia, simply to enhance what has started in Australia already. I also hope to be able, with my presence, to influence the government and some of Australia’s large media firms to more strongly consider transmedia practice and funding multi-platform projects more readily, because I understand it’s been a little difficult. I also, by the way, want to emphasise the fact that you don’t need hundreds of millions of dollars to launch a transmedia project, and I’m going to use some case studies in documentary and in education to show this can be done on a modest budget as well. M: That will certainly be music to a lot of people’s ears… Jeff, thanks so much for your time. All the best for your trip down here.